Last week was the reveal of the DIY blogger house at the Parade of Homes in Daybreak, UT. 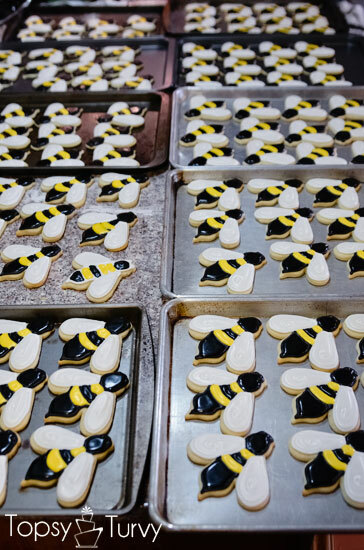 They asked if I would make 10 dozen bumble bee sugar cookies for the evening! It took THREE days, but I’m pretty happy with how they turned out! 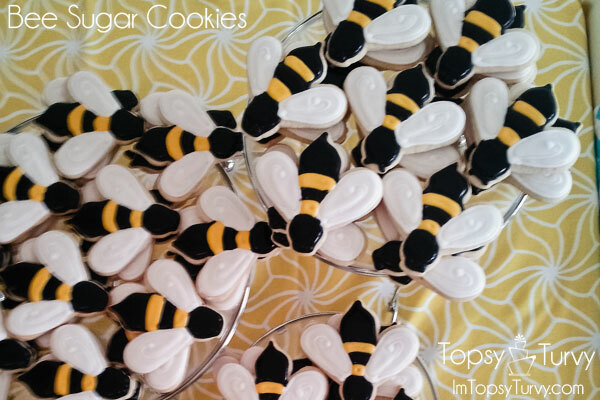 And they were a HUGE hit, but honestly I really didn’t like making them, I would much rather make a cake! So no more orders for cookies or cupcakes- CAKE ONLY! 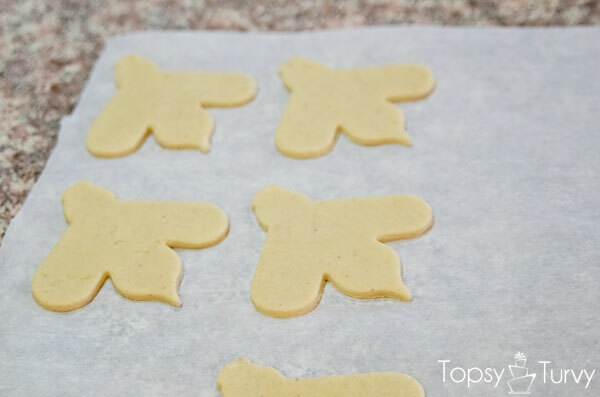 I use my traditional sugar cookies recipe (the one I got from my Grandma). 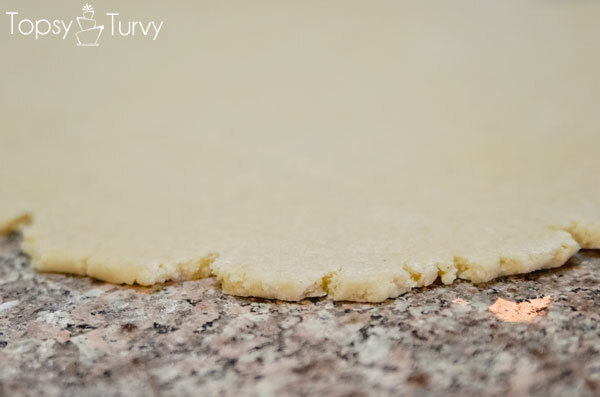 roll out to 1/4 inch- the thickness is KEY- you want a nice thick cookie. cut into shapes! Try to use as much of the FIRST roll out as you can. Once you start kneading the dough it get’s thicker and doesn’t end up tasting as good. 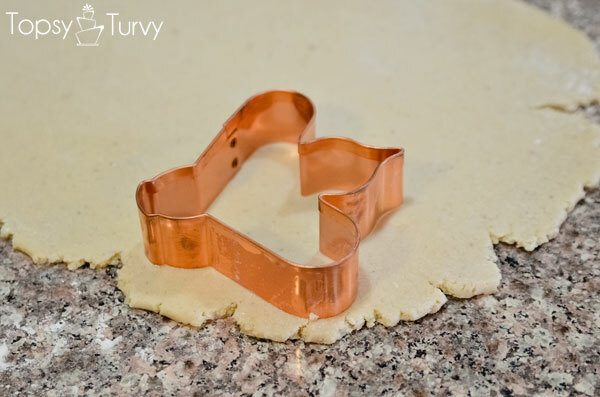 I only knead and roll out and cut 3 times, after that I toss the rest of the dough. Cook at 350 for 8-12 mins, you want the cookies to be JUST cooked, don’t over cook them. I usually cook the first pan 9 mins and the rest (once the pan is warm) 8, but every oven is different so play it by ear. For the frosting I use this frosting recipe, if you want to be able to stack them I’d suggest using royal icing, but for TASTE I like this one better, you can stack them a BIT but I wouldn’t SHIP them or anything. 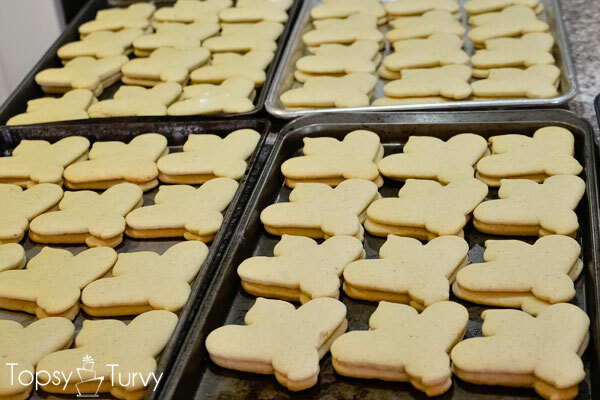 To detailed cookies you do the edging first, in a thicker frosting. 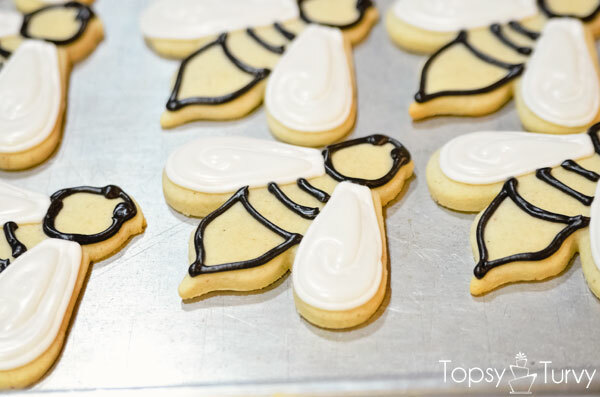 In some cases you edge the whole cookie, for the bee’s I did just the white wings. I decided to add some details in the wings, you want the ENTIRE outline to DRY. 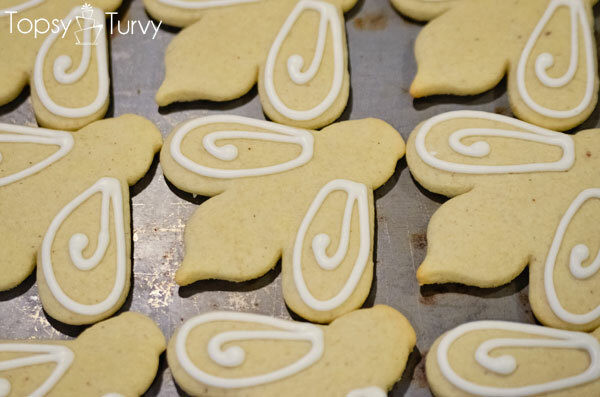 To Thin Icing: To thin for pouring, add 1 teaspoon milk at a time. Keep adding milk until it’s thin enough that when you stir it the lines will smooth out by the time you count to 10. 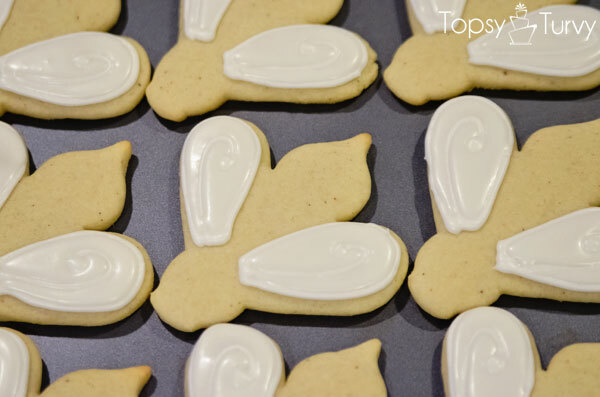 Fill in the remaining spaces with thinned black icing! And again LET IT DRY! It’s the key to the whole effect, letting each step dry completely before moving on. But it’s also one of the reasons it’s so time consuming! 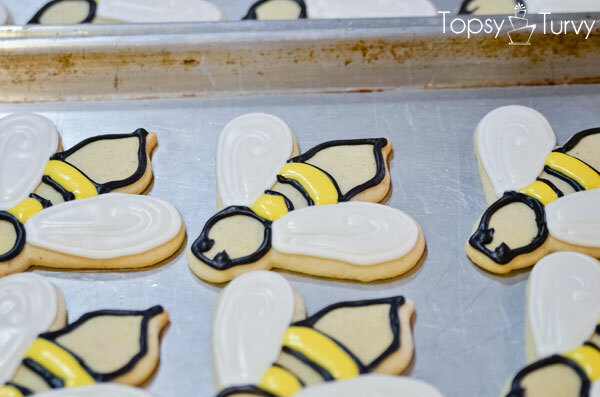 thin the small portion of yellow icing and fill in the last two stripes! Also the piping muscles in my arm hurt for 2 days after all this piping! By the time I got to the end of all the piping I couldn’t open my hand by myself, I had to slide the bag out of my clenched fist and massage it open. But they looked great, tasted better, and were a huge hit! And it’s OVER! nothing is too pretty to eat 😉 thank you so much! I got mine from Gygi’s and I love it! If your ever in the area let me know! Where are you moving to? I’m so glad! they are super cute and fun! 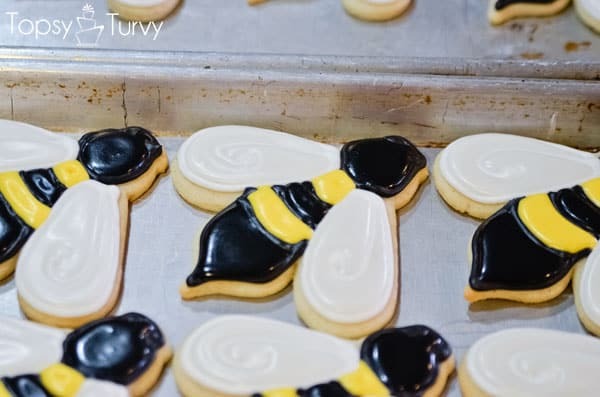 any idea where I can purchase the bee cookie cutter. I know they are others out there, and I have some, but I’d like this one. If you know where to buy it, please let me know. Thank you. I got it at a local place years ago, I’m not sure if anyone is selling this one anymore.